Tankless Vs Tank Water Heaters: What’s The Difference? 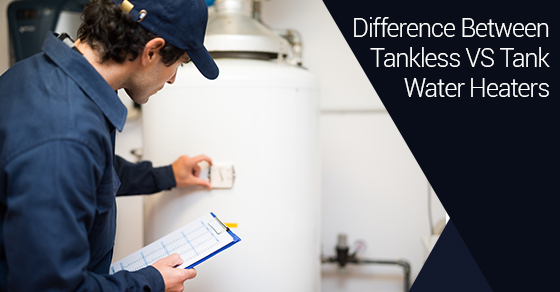 | Imagine Plumbing & Appliance Ltd.
Tankless Vs Tank Water Heaters: What’s The Difference? Whether your water heater recently stopped working, or you’re in the midst of renovating your home or business, water heaters play an important function. Tankless water heaters, also called on-demand or instantaneous water heaters, heat up water as it’s needed via electric or gas. They are also more compact (since they don’t have a tank) and therefore take up less space and can be installed in any number of different areas. Tank heaters, in turn, preheat between 30 and 50 gallons of water at one time in a large storage tank. If you run out of hot water, you have to wait until the tank refills and reheats. Energy efficiency is leading concern for homeowners today. When it comes to water heaters, tankless water heaters flash-heat water only when needed and turn off the second the faucet is turned off. Tankless water heaters were designed with efficiency in mind, and homeowners can save at least $100 per year with an Energy Star tankless water heater. In fact, a new Energy Efficiency Alberta program now offers rebates on home improvement programs, including on Energy Star certified tankless water heaters. Imagine Plumbing is a provincially authorized installer for the program. Tank water heaters, on the other hand, are always running in order to keep the water supply warm and do so regardless of how much water you’re using. As you can see, they are not nearly as efficient as their counterparts. Tankless water heaters typically cost a little more money upfront, but not by a significant margin. Moreover, since they are built for efficiency, monthly energy bills are not as high. They also have a longer life-span, lasting up to twenty or more years. They can also be further maintained by using softened water, as opposed to hard water. With hard water there is a yearly maintenance of flushing out the water, which costs around $250. By opting for softened water, you only need to flush out your tank once every five years. That is a saving of $1000 over four years. Tank water heaters, however, while they cost less up front, result in higher monthly costs. On average, they last between 10 and 15 years, less than half the lifespan of a tankless water heater. If you are in need of water heater repair, maintenance, or installation, Imagine Plumbing is among Alberta’s premier professional plumbers, offering highly efficient services. Our hot water tank technicians are authorized installers of the best tanks in the industry, including Navien®, Noritz® and Rinnai®. Contact us today for more information.